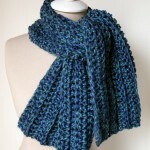 When I designed the Tallulah Waterfall Scarf I was playing with a swirling, twisting stitch pattern. I used it to make two different accessories, and got two very different effects! 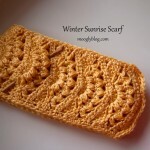 The scarf is the first one I’ve chosen to share – and I can’t resist it’s subtle ruffles! The name Tallulah means leaping water, and the Tallulah Waterfall Scarf seems to float, meander, jump, and twirl just like a waterfall! The scarf is fun, flirty, and light enough to wear as a year round accessory, and an optional button dresses it up and keeps it in place. 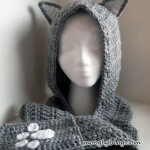 Best of all, it only takes one skein, and 3 rows to crochet – love quick accessory crochet patterns! Make one for yourself, another a gift, and a bunch for the craft fair! NOTE: To start each row, you have a few options. You can use the chainless starting dc st (and the chainless starting dc2tog also shown in the video), which is what I did, and how I wrote the pattern – the first dc or dc2tog of each row is worked in this way. If you’re uncomfortable with that technique, you can ch 2 to start (and add 2 to the starting ch), and then work the sts as directed. Alternately, if you’re using this pattern as a stash buster and want to change colors every row, you can use the standing dc st to begin! Row 3: Work 3 dc in the 1st st, dc in the next st, dc2tog in the next 2 sts. *Ch 4, skip the 3ch. Work 3 dc in the next st, dc in the next st, dc2tog in the next 2 sts. Repeat from * to end. Break yarn and weave in ends. (636 sts and ch) There should be just a few yards left to make the button! Row 1: Starting with a magic circle, work 5 sc into the ring and join with a sl st to work in the round. Pull the center closed with the end, but not too tightly – we’re going to poke the button shank through the hole later! Row 2: Ch 1, work 3 dc in the 1st st, ch 1, sl st in 1st st. *Sl st in the next st. Ch 1, 3 dc in the same st, ch 1, sl st in the same st. Repeat from * 3 more times, until 5 petals made. Break yarn if needed, leaving a 12 inch tail for sewing. Assembly: Insert the shank of the button through the hole in the center of the flower, from the right side. Tighten up the hole using the short beginning tail. Using the long tail and a yarn needle, sew through the shank and a few strands of the flower on the other side to secure. Then sew through the holes of the clear button, somewhat loosely, to attach it to the end of the shank. Weave in all ends. See photos above for reference. And now it’s time to wear your new scarf! The Tallulah Waterfall Scarf can be worn in all sorts of ways – long and loose, wound up tight, tied in a bow… you name it! Lay it carefully for a ruffled effect or let it twist wild and free as a waterfall! The button fits right into the chain spaces to help keep it secure the way you want – and it adds a sweet little touch too! 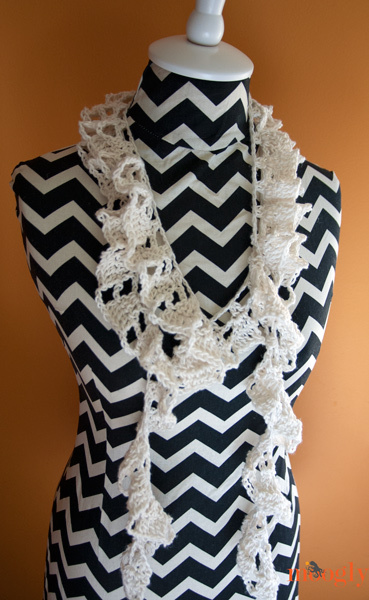 And of course it isn’t limited to the scarf – put it on your crochet hat to change it up! I can’t wait to see what you all do with this pattern! 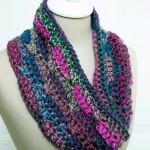 Very pretty scarf! I made one for myself and may need to make some for some Christmas presents! Thank you Tori! I’m so glad you like it! Very very pretty and unique – love it! Well, it’s definitely a “holey” scarf, very lightweight. It sounds like maybe your tension is looser and that’s why the stitches are more open? It’s so hard to say for sure without seeing it. If it’s not long enough you can certainly increase the length as desired, in multiples of 3. Where should I attach the flower button?